In a major triumph for alternative-energy researchers and enthusiasts, an experimental, solar-powered plane on Thursday successfully completed a 26-hour flight powered by 12,000 solar cells and sunlight-powered lithium batteries. The Solar Impulse, a slender, long-winged airplane, flew through the night over Switzerland, fueled by energy it had collected during the previous day. Solar Impulse reached a height of 28,000 feet and a top speed of 78 mph in what project coordinators called the longest test flight of a piloted solar-powered aircraft. 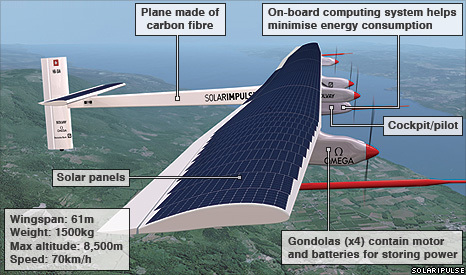 The solar plane project was launched at the end of 2003 under the guidance of Bertrand Piccard, the first person to complete a nonstop balloon flight around the world. “This is a highly symbolic moment: Flying by night using solely solar power is a stunning manifestation of the potential that clean technologies offer today to reduce the dependency of our society on fossil fuels,” said Piccard, in a statement. The aircraft landed where it had taken off — in Payerne, Switzerland. Andre Borschberg, 57, a former Swiss air force fighter pilot, flew the plane. Dan Olds, an analyst at Gabriel Consulting Group, called the flight a “showy win” that should help organizers gather support for solar power and for solar-powered vehicles in particular. However, while we may not be taking our next vacation or business trip on a solar-powered commercial jet in the near future, Olds said airplanes could get an energy boost from solar power. Solar cells have been powering some novel projects. NASA’s robotic rovers, which have been working on the surface of Mars, have been powered only by solar power. Astronauts and robots have worked hand in hand to install a massive solar array on the backbone of the International Space Station to power the orbiter.